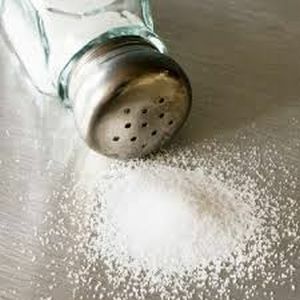 Table salt, often called "cooking salt" or just "salt", is widely used in cooking to add flavor to food. Salt consisting of sodium and chloride which is usually derived from salt mines, but can be obtained from sea water, and is heavily processed. It is 99.9% sodium chloride because the trace minerals are lost during processing. It contains iodine and anticaking agents as additives; noniodized is also available. Soak stained hankies in salt water before washing. Sprinkle salt on your shelves to keep ants away. Soak fish in salt water before descaling; the scales will come off easier. Put a few grains of rice in your salt shaker for easier pouring. Add salt to green salads to prevent wilting. Test the freshness of eggs in a cup of salt water; fresh eggs sink; bad ones float. Add a little salt to your boiling water when cooking eggs; a cracked egg will stay in its shell this way. A tiny pinch of salt with egg whites makes them beat up fluffier. Soak wrinkled apples in a mildly salted water solution to perk them up. Rub salt on your pancake griddle and your flapjacks won't stick. Soak toothbrushes in salt water before you first use them; they will last longer. Use salt to clean your discolored coffee pot. Mix salt with turpentine to whiten you bathtub and toilet bowl. Soak your nuts in salt brine overnight and they will crack out of their shells whole. Just tap the end of the shell with a hammer to break it open easily. Boil clothespins in salt water before using them and they will last longer. Add a little salt to the water your cut flowers will stand in for a longer life. Pour a mound of salt on an ink spot on your carpet; let the salt soak up the stain. Clean you iron by rubbing some salt on the damp cloth on the ironing surface. Adding a little salt to the water when cooking foods in a double boiler will make the food cook faster. Use a mixture of salt and lemon juice to clean piano keys. To fill plaster holes in your walls, use equal parts of salt and starch, with just enough water to make a stiff putty. Rinse a sore eye with a little salt water. Mildly salted water makes an effective mouthwash. Use it hot for a sore throat gargle. Dry salt sprinkled on your toothbrush makes a good tooth polisher. Use salt for killing weeds in your lawn. Eliminate excess suds with a sprinkle of salt. A dash of salt in warm milk makes a more relaxing beverage. Before using new glasses, soak them in warm salty water for awhile. A dash of salt enhances the taste of tea. Salt improves the taste of cooking apples. Soak your clothes line in salt water to prevent your clothes from freezing to the line; likewise, use salt in your final rinse to prevent the clothes from freezing. Rub any wicker furniture you may have with salt water to prevent yellowing. Freshen sponges by soaking them in salt water. Add raw potatoes to stews and soups that are too salty. Soak enamel pans in salt water overnight and boil salt water in them next day to remove burned-on stains. Clean your greens in salt water for easier removal of dirt. Gelatin sets more quickly when a dash of salt is added. Fruits put in mildly salted water after peeling will not discolor. Fabric colors hold fast in salty water wash. Milk stays fresh longer when a little salt is added. Use equal parts of salt and soda for brushing your teeth. Sprinkle salt in your oven before scrubbing clean. Soaked discolored glass in a salt and vinegar solution to remove stains. Clean greasy pans with a paper towel and salt. Salty water boils faster when cooking eggs. Add a pinch of salt to whipping cream to make it whip more quickly. Sprinkle salt in milk-scorched pans to remove odor. A dash of salt improves the taste of coffee. Boil mismatched hose in salty water and they will come out matched. Salt and soda will sweeten the odor of your refrigerator. Cover wine-stained fabric with salt; rinse in cool water later. Remove offensive odors from stove with salt and cinnamon. A pinch of salt improves the flavor of cocoa. To remove grease stains in clothing, mix one part salt to four parts alcohol. Salt and lemon juice removes mildew. Sprinkle salt between sidewalk bricks where you don't want grass growing. Polish your old kerosene lamp with salt for a brighter look. Remove odors from sink drainpipes with a strong, hot solution of salt water. If a pie bubbles over in your oven, put a handful of salt on top of the spilled juice. The mess won't smell and will bake into a dry, light crust which will wipe off easily when the oven has cooled.